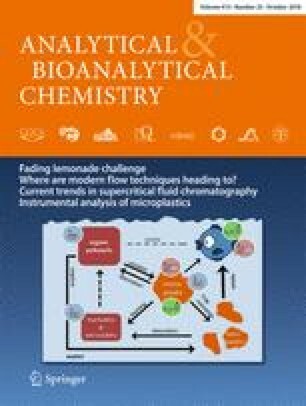 Variable domain of heavy chain antibody (nanobody, Nb) derived from camelids is an efficient reagent in monitoring environmental contaminants. Oriented conjugates of Nbs and bacterial magnetic particles (BMPs) provide new tools for the high-throughput immunoassay techniques. An anti-tetrabromobisphenol-A (TBBPA) Nb genetically integrated with an extra cysteine residue at the C terminus was immobilized onto BMPs enclosed within the protein membrane, using a heterobifunctional reagent N-succinimidyl-3-(2-pyridyldithiol) propionate, to form a solid BMP-Nb complex. 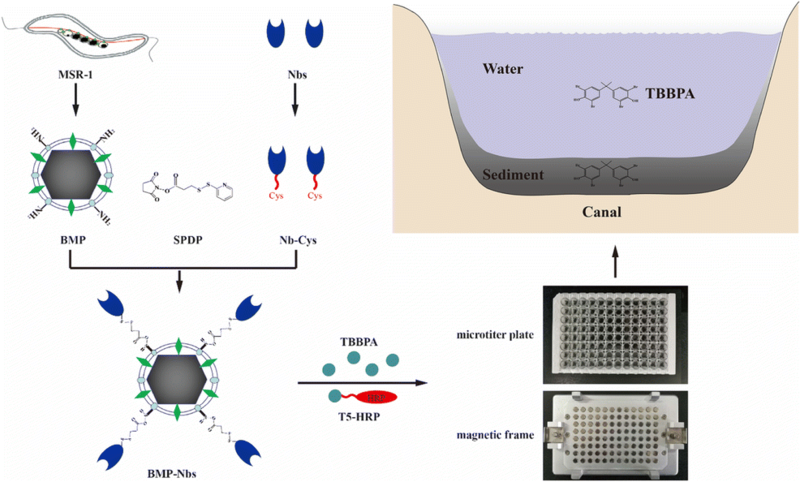 A rapid and sensitive enzyme-linked immunosorbent assay (ELISA) based on the combination of BMP-Nb and T5-horseradish peroxidase was developed for the analysis of TBBPA, with a total assay time of 30 min and a half-maximum signal inhibition concentration (IC50) of 1.04 ng/mL in PBS (pH 10, 10% methanol and 0.137 moL/L NaCl). This assay can even be performed in 100% methanol, with an IC50 value of 44.3 ng/mL. This assay showed quantitative recoveries of TBBPA from spiked canal water (114–124%) and sediment (109–113%) samples at 1.0–10 ng/mL (or ng/g (dw)). TBBPA residues determined by this assay in real canal water samples were below the limit of detection (LOD) and in real sediments were between <LOD and 23.4 ng/g (dw). The BMP-Nb-based ELISA shows promising application in environmental monitoring. The online version of this article ( https://doi.org/10.1007/s00216-018-1270-9) contains supplementary material, which is available to authorized users. This work was supported in part by the Project of the National Natural Science Foundation of China (21577170), Key Project of Inter-Governmental International Scientific and Technological Innovation Cooperation (2016YFE0108900), China and the National Institute of Environmental Health Sciences Superfund Research Program, P42ES04699, USA. The authors declare that they have no conflict of interest. This research did not involve human participants or animals.